One Savvy Mom ™ | NYC Area Mom Blog: Anniversary Event 2011: Imagination Movers "In a Big Warehouse" Concert Tour! Anniversary Event 2011: Imagination Movers "In a Big Warehouse" Concert Tour! Emmy Award-winning Imagination Movers kicked off their "In a Big Warehouse" concert tour on February 4, 2011 in their home state of Louisiana. The wildly popular New Orleans-based rock band for kids of all ages will travel coast to coast playing their most popular songs and bringing the magic of the Imagination Movers television series' Idea Warehouse to life performing in a series of 100 shows across the nation. Concertgoers can expect special appearances from Nina, Warehouse Mouse and other characters from the TV series, also joining the tour......Disney Juniors Choo Choo Soul! The tour will visit more than 50 cities, including New York, Los Angeles, Chicago, San Francisco, Boston and Washington, D.C. Tickets are available now at http://www.ticketmaster.com/ There are also VIP packages for fans available in many cities. For details on the tour dates, VIP packages and venues visit http://www.imaginationmovers.com/ . We are absolutely thrilled to attend the Imagination Movers "In a Big Warehosue" concert tour in our area in April! The kiddo's can't wait to see their absolute favorite Disney stars perform live (B is a SERIOUS fan! He ran around all last summer with a cowboy hat on saying "just call me Smitty!")! Keep an eye out for our review in April! 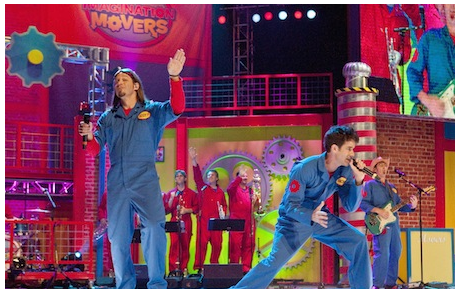 Would your little one's like to see Imagination Movers "In a Big Warehouse" concert tour? Of course they would! One Lucky Reader will receive a family 4 pack of tickets! 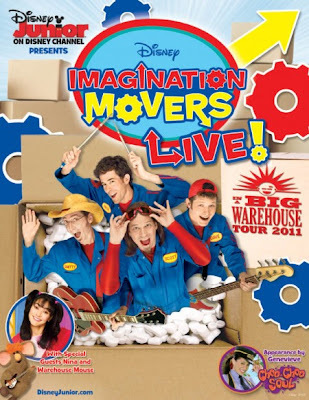 Tickets for the Imagination Movers "In a Big Warehouse" Tour are on sale now at http://www.ticketmaster.com/ . You can find more information about the Imagination Movers and a full list of Tour dates at http://www.imaginationmovers.com/ . DISCLOSURE: Access to this event was provided to the editor (s) of this site, for review purposes. We are not required to write a positive review. The opinions expressed in this post are our own and may differ from others. We are disclosing this in accordance with the Federal Trade Commission’s 16 CFR, Part 255.